While many Maine camps recruit across the nation, even across the Atlantic, the state’s thriving camp industry also reaches large numbers of young Mainers. Every summer, in Stoneham in Western Maine, Camp Susan Curtis welcomes hundreds of kids. They are all from Maine and, aside from a small registration fee, they attend camp free of charge. Camp Director Terri Mulks said campers come via school referral partners. The only qualifying requirement is that applicants be eligible for free or reduced lunch according to USDA standards. Mulks said the camp’s impact on children is often revealed in reflection letters they write to thank Susan Curtis Foundation donors. Among campers’ observations is the feeling of being accepted for who they are, Mulks said. Another significant outcome: Campers who have attended for four or more years, and participated in its leadership program, have a 100 percent high school graduation rate. The four two-week sessions serving kids grades 3-9, plus leadership programming for grades 10-12, provide a broad range of traditional camp activities. Older campers can pursue art, science and technology, or community service interests. Summer 2019 will be the camp’s 45th season, and Mulks said plans include celebratory events. If enrollment goals are met, those events will be enjoyed by a full camp that includes kids from all 16 counties. 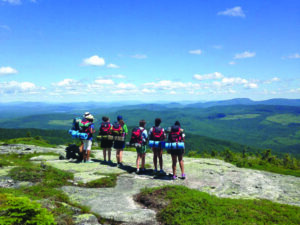 The Girls Scouts of Maine also reach statewide to enroll girls in Camp Pondicherry in Bridgton, and Camp Natarswi, bordering Baxter State Park in Millinocket. Mary Ellen Deschenes, chief of outdoor operations, said many campers are not active Girl Scout participants but seek the camp experience the organization offers. More than 500 girls – “a handful from out-of-state” – took advantage of a week or more at the camps last summer, Deschenes said. She says the tuition fee of $440 per week-long session helps make camp accessible to a broader range of participants. A scholarship fund helps defray costs for qualifying campers as well. 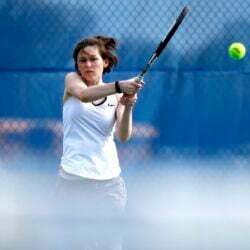 In addition, Deschenes said girls can earn a free session at camp through fundraising efforts – product sales that take place throughout the school year and include the celebrated Girl Scout cookies. About one-third of last summer’s campers were there thanks to such efforts, she said, and 172 have reached the first sales milestone this year. 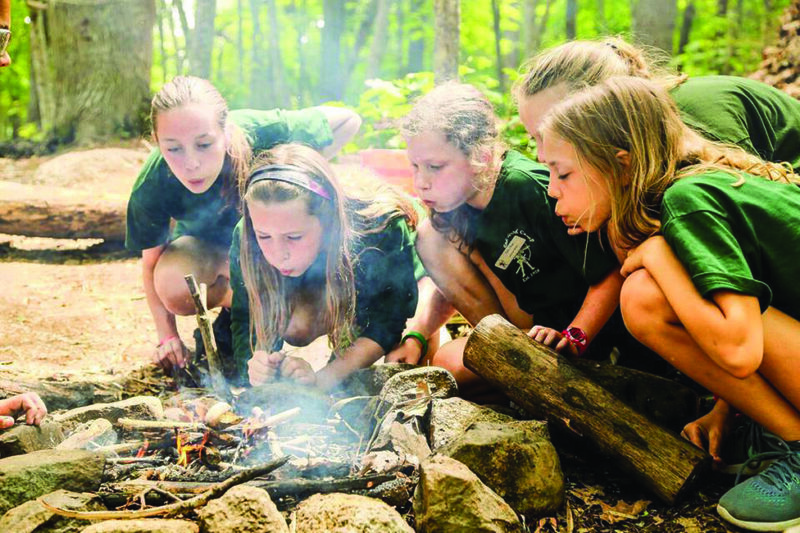 At Camp Natarswi, girls can participate in a four-week Junior Maine Guide program, which includes training in a range of outdoor living skills – canoeing to axemanship, shelter and fire building to tree identification. JMG candidates then attend a five-day testing camp with aspiring JMGs from other camps in Maine. Camp Pondicherry’s program differs somewhat from Natarswi’s, Deschenes said, and geography doesn’t necessarily dictate which camp girls attend. Youngsters from Aroostook County may travel to Bridgton; girls in southern Maine may enroll at Natarswi. On Maine’s midcoast, Jessica Decke directs the 4-H Camp and Learning Center at Tanglewood, in Lincolnville. The program was established in 1982. Decke said its original directors were dedicated to “developing a summer camp affordable to Maine families, especially those in rural communities.” That commitment continues today, she said. Because not all families are familiar or comfortable with an overnight experience, the camp also offers a day program. Either way, Decke says a camp experience is promoted as “an investment in the development of a child.” Scholarship support is available, she says, and “we don’t make it hard” for families to request that support. All families pay something, creating “a sense of ownership.” “We work with each family,” she said. About 1,200 kids were served last summer. In Southern Maine, Camp Ketcha in Scarborough also strives to present adult role models to the youngsters it serves. “We’re focused on giving kids a classic summer camp experience,” said Executive Director Tom Doherty. A day camp, Camp Ketcha daily serves more than 300 kids, age 4-14. Those kids often continue into the camp’s counselor and leadership training programs, Doherty said. They participate in a full range of traditional camp programs, from swimming to archery to a ropes course. The camp has also revamped its barn program to offer year-round farm education. Kristine Snow Millard is a free-lance writer from Portland and a fan of all things summer, including camp.